Hello White Dog Blog Fans! NEW this class session is Enrichment and Games - 6 weeks full of fun activities for you and your dog to do together to enhance his/her quality of life, to build confidence, and to ward off boredom and the behavior issues that often come with it. Enrichment and Games will be kicking off on Aug. 26th. Offered again this session will be Grooming, Husbandry and Handling Games, due to popular demand. Many of you missed it the first time around and asked for it to be offered again. We will use positive reinforcement to help our dogs learn to enjoy and cooperate with everyday husbandry and grooming behaviors. Past Grooming students, feel free to join us again this session if you'd like. You already have access to the course material - we'd love to have you offering support in the Facebook group to the newer Grooming students! This course will also kick off on Aug. 26th. Offered as an ongoing self-study course, that you can join at any time, is Positive Reinforcement and Clicker Training. This course will get you started off right on the road to training and communicating with your dog in a positive manner! Start anytime! The Easy Blog Reference Guide is offered FREE to students signed up through Uniquely Paws-Able. With this guide, you can easily navigate The White Dog Blog and find posts of interest quickly. Check out the Reference Guide today! 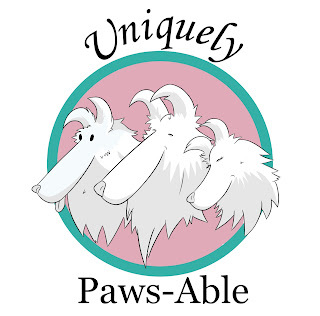 Another NEW offering is the FREE Library section - exclusive to Uniquely Paws-Able members. I am building this Library as a resource center for those interested in double merles, blind and/or deaf dogs, training (for any dogs), wellness, and just wants to get into my head and see what I like. There are some articles loaded there now - check back frequently! I have new classes in the planning stages and would love to know what classes you're waiting for and would love to see! Please reach out with your ideas! This school is all about helping you learn more about your dog!